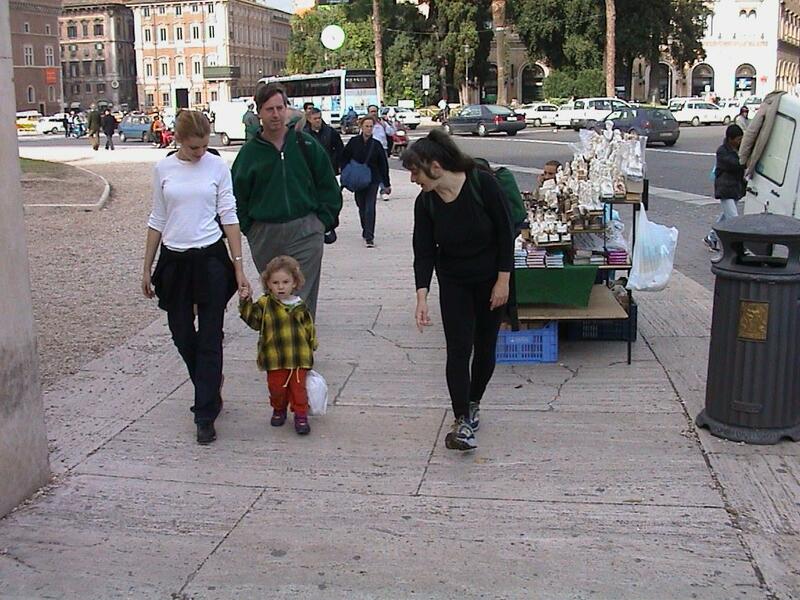 Having visited the Vittorio Emmanuele II monument we walk down Via Dei Fori Imperiali towards the Colosseo. We stop to sip some water (the unseasonably warm weather does take its toll on pedestrians) and admire the wide street, another of Il Duce's works. To facilitate rows and rows of tanks and armored vehicles as part of his "victory parades" Mussolini knocked away ancient ruins to widen the path to four lanes. It's very out of place in central Roma. Hadrian's Market is to our left. Within a minute or two we come face to face with the center of the Empire, the Foro Romano (Roman Forum). From this spot an Empire was ruled (and more importantly, coördinated). We stood for a moment, imagining what things must have been like during the heyday of the Roman Empire. We could almost hear chariots bearing messages and information coming and going. The Foro Romano was the political and economical centre of Rome. 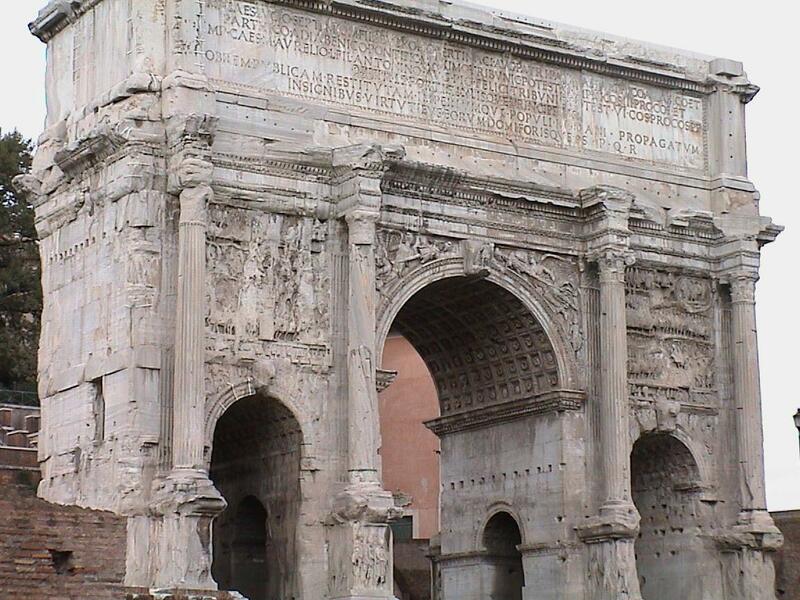 In the complex was the Regia, the residence of the kings, and later of the Pontifex Maximus; there was the Curia, where the Senate met; the Comitium and the Rostra, where public meetings were held; important sanctuaries (Temple of Castor and Pollux, Temple of Saturn, Temple of Vesta); markets and tribunals of ancient Rome (Basilica Aemilia, Basilica Julia). We walked down the path which appears in the center of the panorama above. Isaac knows for what a handrail is used, but in this case opted for "Cicki hand". Our little traveller is completely unfazed by crowds, and frequently looks back to see where we are (not that one of us isn't at hand, but it's good that he checks). (That's Rose with the backpack and the orange fleece.) 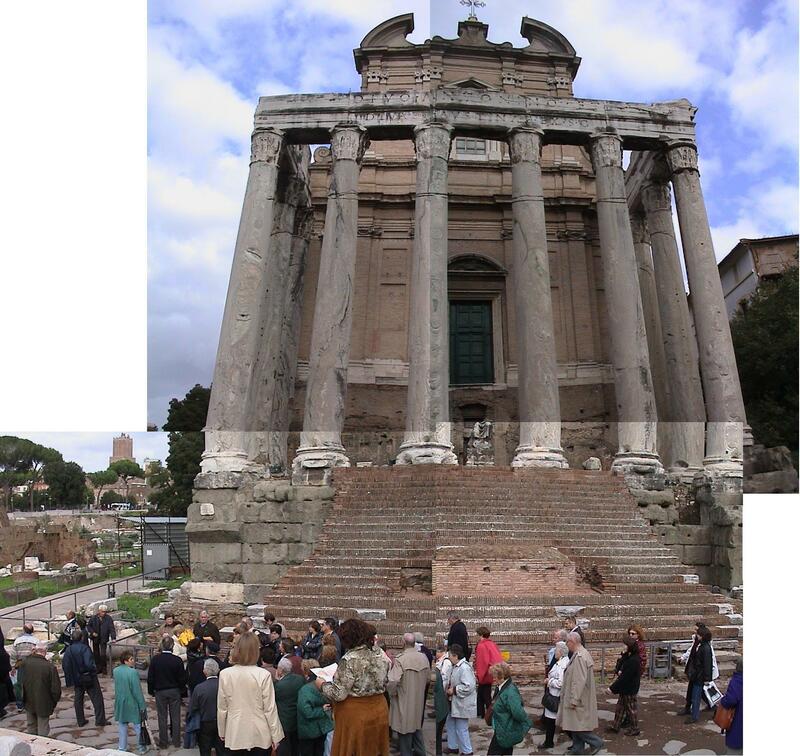 The panorama below is what the forum ruins look like from the other side. 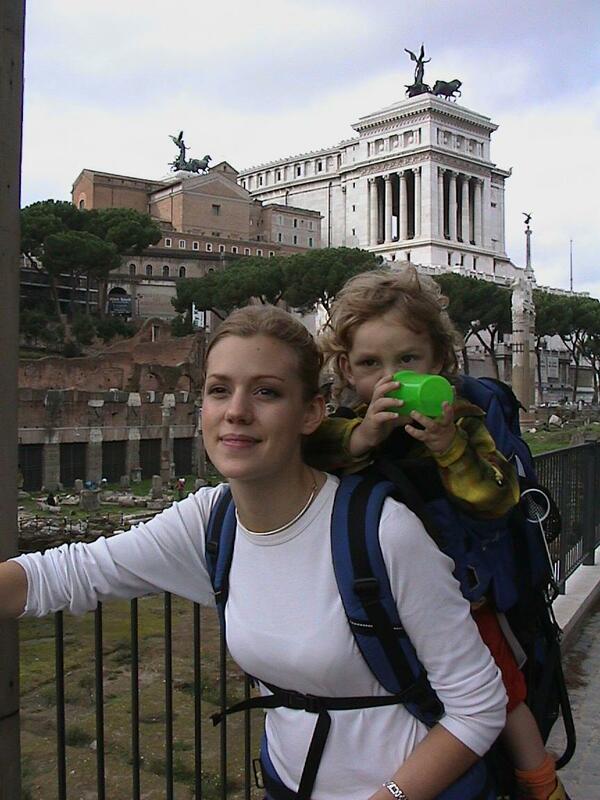 From the far side we continue downwards, this time to the center of the Forum. Here we walk down the paths that the Senators trod while upon their business. The number of different languages I heard from the tour guides was amazing. That day large contingents of Russians and Poles were present. Because His Holiness was going to bless members of the armed forces, solders from every branch of service from dozens of countries were in uniform, touring the city. Here's what the Forum looks like from the side closest to the Coliseum.